POD represents the fields of wheat found in the Saskatchewan prairies. 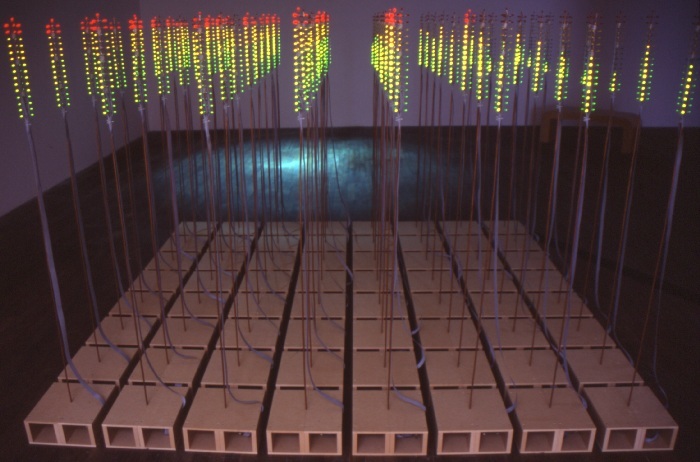 It was created using data from the Wind Array Cascade Machine (WACM) sensor network and data archive. 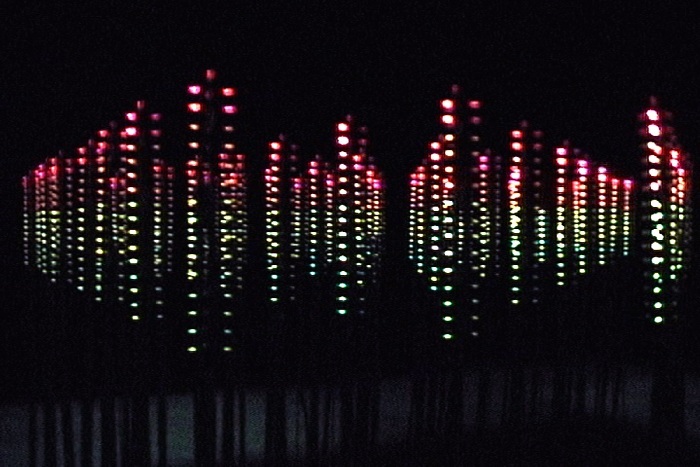 This 64-channel installation uses 2,880 light emitting diodes (LEDs) to portray a 4-dimensional picture of the wind wave patterns (3D plus time). The POD installation is 3 metres by 3 meters across, and 1,75 metres tall (eye level). 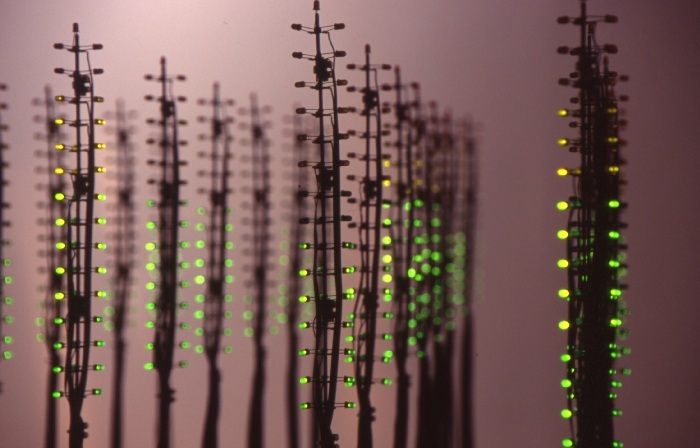 Each of the 64 LED “pods” functions like a velocity or amplitude meter for each of the 64 wind sensors in the WACM data network. As the amplitude or strength of the wind increases (or decreases) from the WACM data so does the light level of POD‘s LED clusters from low (dark green) to high (red) in 15 visual increments. We all normally think of the wind as sound, but wind is not actually heard. We only hear the objects the wind touches (including our ears). By changing wind patterns into light, the silent wave patterns presented by POD become a catalyst for synesthetic observation, where many who have watched POD have also said they have heard it. 2005 • Honorary Mention in Interactive Art, Prix Ars Electronica 2005, Linz, Austria. 2007 • The Centro Cultural de la Pontificia Universidad Católica del Perú – Groupe Molior, Transitions / Transiciones, group exhibition, Lima, Perou. 2005 • O.K Centrum für Gegenwartskunst Oberösterreich, OK Cyberarts 05 – Prix Ars Electronica Exhibition, group exhibition, Linz, Austria. 2004 • Kiasma Museum of Contemporary Art – The Finnish National Gallery, ISEA 2004 Wireless Experience Exhibition, Helsinki, Finland. The original electronic and software systems for POD were designed in collaboration with Avatar (technicians: Steeve Lebrasseur and David Michaud), Québec, QC/CA. POD was created during a generous artist creation and production residency at Recto-Verso / Mois Multi Festival (2003), Québec, QC/CA. POD was produced with the assistance of the Media Art Sections by: Le Conseil des arts et des lettres du Québec and The Canada Council for the Arts.